Since When Do Style Points Determine Whether a Pitch Is a Strike? I never thought I'd say it, but umpire Mike Winters just proved that he views officiating at home plate the same a figure skating judge does in the Olympics. An inadequate "presentation" from Dodger catcher A.J. Ellis kept him from calling borderline pitches strikes. Are you kidding me? That has to be the most ridiculous thing I have ever heard and who can blame Ellis one bit for arguing to the point of receiving his first ever ejection last night? I was pretty much against instant replay when the officiating review rules were introduced. And I still have my reservations about it, since I've seen some questionable decisions made in New York after reviewing plays, but one thing it has proved is that the four guys officiating each game certainly make a lot of mistakes AND they can be replaced. Perhaps it is time to seriously consider replacing them completely, and that has to do with the guy calling balls and strikes. It's time for Joe Torre to stand up and punish this umpire. If A.J. Ellis is correct in stating that Winters said that the way he caught the pitches, or essentially his poor pitch framing made it difficult to call some strikes, then that's an admission that his calls are based on the acting skills of the receiver and not where the ball is while it crosses the plane. A.J. isn't a liar, and why else would this level headed veteran lose it to the point of ejection? But Joe Torre has had it in for the Dodgers for some reason since he left in 2010, so I highly doubt anything will be done. We've seen a number of replays go against Los Angeles since these changes were instituted, and call me crazy, but I simply don't trust MLB brass and the officiating staff headed by Torre at all. I have no proof of any shenanigans, just an opinion of a distant observer, coupled with the frustrations of a Dodger fan that has watched his team whittle away a first place lead of 5-6 games in a few weeks time. It's tough enough to beat the likes of San Francisco and St. Louis on an even playing field, but when you've got umpires doing stupid things like calling pitches based on style points of the catcher, well that takes frustration to new levels. It certainly has been a unique way to handle the 5th spot in the Dodgers rotation. With Hyun-Jin Ryu and Brandon Mccarthy's injuries, you're think that the Dodgers would be in a bit of a panic mode a little more than month into the season, but the Dodger front office has handled the problem in a unique way. I call it the revolving OKC door. Others may name it the "catch and unconditional release" method. 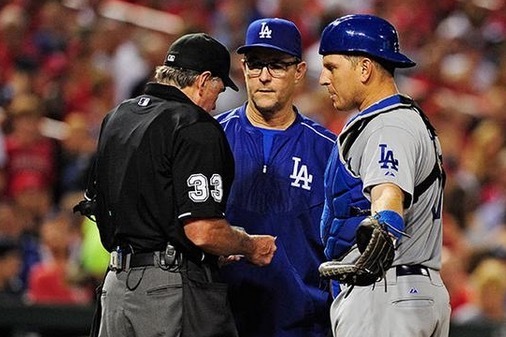 Whatever you call it, it has worked so far, but how much longer can the Dodgers continue this? That answer might surprise you. I think it might go on for months. David Huff, Mike Bolsinger, Scott Baker, Carlos Frias, and Joe Weiland have made spot starts in the fourth and fifth rotation spots. Relievers Daniel Coulombe, Sergio Santos and Adam Liberatore have bounced between AAA and the majors in that 25th spot too. Mix in position players like Darwin Barney, Chris Heisey and Enrique Hernandez and there you have the 25th man, made up of eleven different guys. 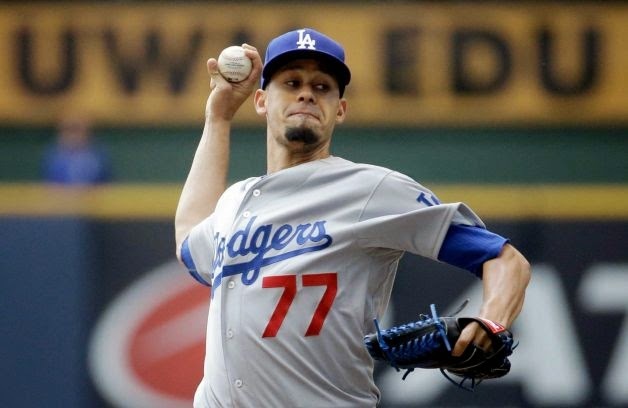 By far, the Dodgers are making the most moves in baseball as they juggle their roster. The risks? Losing the players they send down who have major league service time on the waiver wire, but so far, nobody is picking those men up off the scrap heap. That may change over time as rival NL West teams might want to mess with the Dodger's GM strategy as they repeat this process again and again. The thing is though, there isn't much desire by other clubs for these types of players, and if they are snatched up by another team after the Dodgers unconditionally release them...it's no big deal anyway. The guys like Baker, Barney, Bolsinger and Huff are serviceable players, but they aren't "difference makers." At least we think that way now anyway. And again, the Dodgers appear to be snake-bit on the injury front again, perhaps more than any other team in the game. More and more, this is becoming the M.O. of the L.A. Dodgers. The front office loads up on depth and in the end, it proves beneficial. How much would we have liked to hold on to Dan Haren right now? Who can complain though? 19-10 is their record, and that's with the starting staff 40% gone and Clayton Kershaw not hitting his stride yet. Friedman and Zaidi obviously know what they're doing and they have a plan. It is probably plan "C" or "D" that is currently in place, but it's a plan nonetheless, and in the end, the ball club isn't panicking and overpaying in a desperate trade for someone like Cole Hamels. At least not yet.